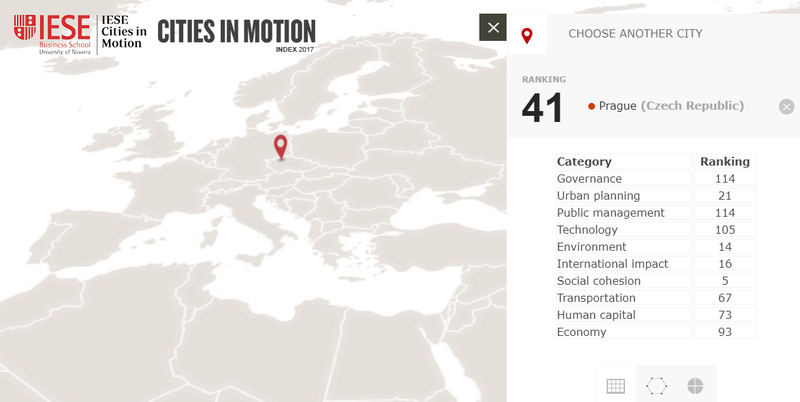 IESE Cities in Motion Strategies is a research platform launched jointly by the Center for Globalization and Strategy and IESE Business School’s Department of Strategy. The initiative connects a global network of experts in cities and specialist private companies with local governments from around the world. The aim is to promote changes at the local level and to develop valuable ideas and innovative tools that will lead to more sustainable and smarter cities. In Eastern Europe, the ranking is led by Prague, which also occupies significant positions in the social cohesion and environment dimensions in the overall ranking. It is followed by Tallinn and Budapest. Closing the list of the top five cities in the region are Warsaw and Riga. It is worth noting that this region is the one that has progressed the least compared with other emerging regions, the report says. Berlin ranked 9th, Vienna 15th, Bratislava 77th. Read more details. A summary in Czech by ihned.cz.